This evening, I stumbled across a handful of photos in my camera that hadn't yet made it to the website along with their recipes. I hate to feel like I'm depriving you guys, the way a mother neglects her ugliest child, so here's the first one. 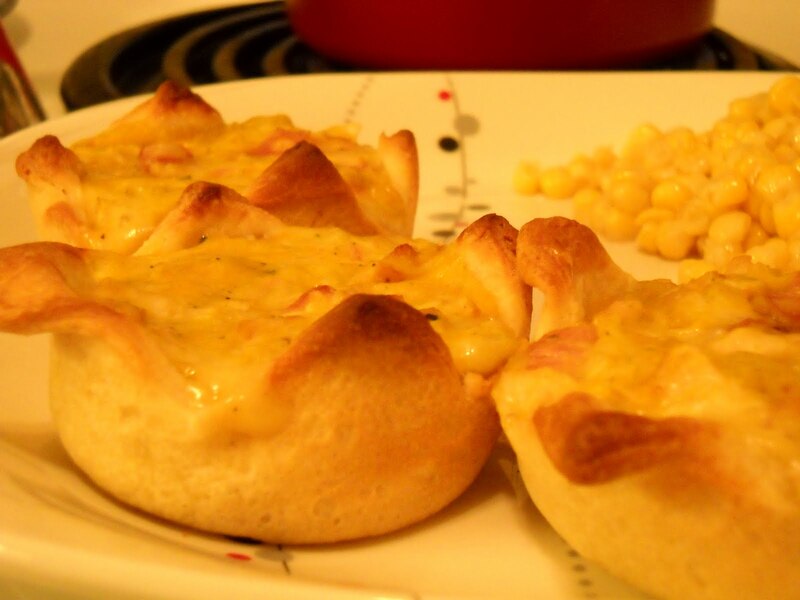 I thought I'd fancy up Mr. FvF's favorite, the cheesy chicken cups. I decided to use seamless crescent dough instead of biscuits and add whatever sounded good. Basically, you follow this recipe, sub the biscuits for crescents (and I'm guessing phyllo dough or puff pastry would work equally well) and toss in some chopped ham. Oh, and if you're in the market for deli or lunch meat, do your belly a favor and pick up some of the Private Selection Honey Bourbon ham from Kroger, and prepare to fall in love.